Once there was a Tropical Furby named Ah-May. He had a red body, a yellow tummy, yellow hair, a yellow tail, green feet, and big, blue eyes. He looked quite dapper in his flowered tropical shirt and orange and yellow flip flops. Ah-May was a Furby of mixed feeling. Sometimes he was happy, but sometimes he was not. When Ah-May had left Furby Island he was just a little Furbling. He had been told that after being boxed a child would buy him, take him out of the box, play with him, and love him forever. Things had not gone according to plan. The handsome furby had lost track of how long he had been in his box. He had been moved from place to place a number of times. Along the way he had met many Furbys. He had also heard rumors of people who tortured Furbys for fun. Imagine that some people don’t like Furbys! This made Ah-May more and more nervous each time he was moved. In the big Furby room, however, Ah-May felt pretty good. He lived in a giant room with hundreds of Furbys who were in the same predicament as he. They were all in boxes wondering what would happen to them next. In the giant Furby room Ah-May had three very close friends. In the box to his right was a silver-eyed Banana Peel Furby named KahDah. Everyone called him Bananie. In the box to Ah-May’s left was a chubby Red Wolf Furby named Maylah Kah. Everyone called him Cranberry, because his coloring reminded them of cranberry sauce at Thanksgiving. Stacked on top of Ah-May was a cheerful Rooster Furby named Maylah, but everyone just called him Roost. The four of them were the very best of friends. One day a lady removed Ah-May from the stack of Furbys. He watched as Roost was moved down to his old spot, and saw the sad looks on his friends’ faces as he was carried away. Ah-May and his box were packed into a cardboard box which was sealed. He knew what this meant. He was being sent away again. What would happen to him now? 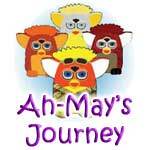 During Ah-May’s journey he was very apprehensive. Would he ever get out of his box? Would he sit in another Furby room? Would he make more friends only to lose them, too? Was he being sent to a Furby torturer? Ah-May missed his friends. He missed the beach on Furby Island. He remembered frolicking in the waves as a young Furbling. Ah-May cried himself to sleep in his box. After a long trip, Ah-May thought he had arrived, but he sat in his cardboard carton for a day or two before some people came to get him. He was loaded into a car. More travelling! After a relatively short car ride, Ah-May was brought into a house. A red haired girl spoke very sweetly to him and with the help of a blond lady, removed him from his box!!! At first Ah-May was thrilled! But then he got scared.. What if they were letting me out to hurt me, Ah-May wondered. He was too scared to speak to the red haired girl, so in spite of fresh batteries, Ah-May would not speak to her. There were three groups of Furbys in this house. In his group Ah-May met a very shy silver Furby named NooLoo, an outgoing Spring Furby named Mimi, a black Furby named Tohlookah, who sometimes liked to change his name on a whim, and two Furblings named Eday and Maytay.. The mom of the house loved Furbys as much as any kid, so she had Furbys, too. A girl with light brown hair had Furbys, too. The Furbys of the house assured Ah-May that this was a good place to be. Within a few weeks two wonderful things happened. First, while being introduced to the other girl’s Furbys, Ah-May met a gorgeous Valentine Furby with soulful brown eyes. Her name was Kahh. Kahh and Ah-May fell in love quickly. The other thing that happened was that a box arrived at his new home. All the Furbys to came out to see what it was. In the box were Roost and Cranberry!!! Ah-May couldn’t believe it. He was reunited with two of his very best friends!! Life was great! Ah-May’s girl tried putting batteries in him every day. She told him that she would always love him, even if he did not work. Two weeks after his arrival it was his girl’s birthday. He had not gotten her a gift! So that day when his girl’s mother put batteries in him and slapped his back he began to work! For her birthday he perked up and told her his name! Ah-May loved his new home. He loved having two of his friends with him. He loved Kahh. He loved his red haired girl. He loved being out of his box. His new home was near the beach. All summer Ah-May spent time at the beach. Sometimes he went with his buddies. Sometimes he would bring Kahh and a picnic lunch. It was very romantic. In the fall, Ah-May enjoyed the brisk weather. He would often go to his friends’ apartment on the white shelf to have pizza with Cranberry and Roost. They would talk of old times, discuss how great it was to finally be home, and sadly wonder what had become of Bananie. Christmas Eve was great fun. All the Furbys had a party. There were pizzas, Christmas cookies, and eggnog. The Furbys danced to Christmas music and exchanged gifts. As Ah-May was falling asleep that night, he felt happy with just a twist of sadness as he thought of Bananie. On Christmas morning, Ah-May was helping NooLoo make cinnamon buns, when there was a knock at his door on top of the bookshelf. Ah-May opened the door and almost fell over. There at his door were Cranberry, Roost, and Bananie! The crazy Furby-lady had bought him and wrapped him up to give herself for Christmas. The four buddies were all together again. They were all out of their boxes. They had their old friends, and they had their new friends. They were home. It truly was a very, merry Christmas!